This is also the fastest turnaround from bookstore to thrift shop. It was published a few weeks ago. I got it for a dollqr yesterday. 310 pages and 97 chapters with epilgoue. Yeah lots and lots of white space and real short chapters. I highly doubt she wrote it. MHC is 89 years old so 88 when she wrote it, possible but not likely and this novel has Alvirah and Willy. They first appeared in her novel Weep No More, My Lady they are lottery winners. They also have been married 45 years. They have only appeared in her short story collection The Lottery Winner and the novels she cowrote with her daughter Carol. Now last book by MHC I read prior to this was I Heard That Song Before and until then these characters except for Weep No More never appeared in her solo written novels only short story collection. Now a common theme in her novels is grief. The main character dealing with the loss of their loved ones whether its recent or decades ago by murder. Celia the kimda main character saw her fiancée arrested for investor fraud ie taking folks money amd claiming its been invested but really keeping it. Not MHCs typical.grief. This novel no one has already been killed. In fact about a third of a way in someone dies. The entire novel took place on a cruise ship except for the 4 page Epilogue. Ok. Emelia aka Em is filthy rich and owns the Cleopatra necklace which is cursed. The curse is whoever wears the necklace on the water will never make it to shore alive. Note as far as I can tell there is no curse. Em is also in her late 80s. Her accountant is on board with his wife and he is upset because Em wants a secnd firm to go over the books. Yeah he is skimming and a motive. He does get pushed overboard by his wife. He survives after 11 hours due to knowing how to swim and his excess bodyweIght. His wife pushed him overboard since as the widow she would get everything and it would be haarder for Em to get her money back. Em’s assistant Brenda has been stealing her jewelry and replacing them with fakes. Em caught on when she was going to wear her fav bracelet her late hubby gave her. Celia a late 20something who is under FBI investigation since her exfiancee was caught creating fake accounts for phony investments. Hours before Em was killed she gave the necklace to Celia for safekeeping. Celia is a gemologist and cruise speaker giving lectures on gems she also confirms to Em the bracelet is fake. Not 80k that her late hubby gave her. Stupidity reIgns. Not ONE person like the captain,.ship owner nor the security checked with the INTERPOL to ask of if the man on board was possily really their agent. He was the killer. Of course we were told this three chapters later. Celia having the necklace well she realized she would be considered the murderous thief. So Alvirah offered to take it since she totally believed Celia was innocent of everything. She gave it to her hubby Willy who kept it in his jacket pocket. The writing was well simple. 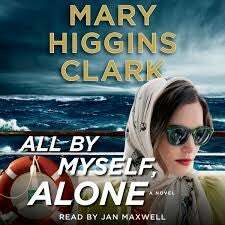 Carol Higgins Clark also writes in a very simplistic manner. Her characters are dumb and act dumb. Also Ted a lawyer who is trying to get Em to hand over the necklace over so it can goback to Egypt. Well he falls for Celia well she is described as looking like Jackie Kennedy and well she just could not be involved with investor fraud or murder. If your read an MHC novel read Weep No More My Lady, Loves Music Loves To Dance, Two Little Girls In Blue, I Heard. That Song Before. Update I did some research starting in 2011 she has written a few novels with Alvirah and Willy.